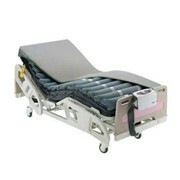 Sexton Textiles provides a range of hospital mattresses and beds. 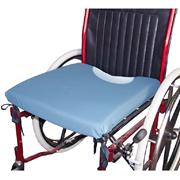 Our finest offering Maxifloat DXP offers three layers of Co-Polymer and Poly-Urethane Foam. It includes an anatomically inspired three zoned middle layer for therapeutic pressure reduction and incredible comfort. The result is very low interface readings and proven clinical outcomes at very cost effective price. The exclusive MaxiFloat Heel Pillow significantly reduces interface pressure in the sensitive heel area, for the life of the mattress. Its patented multi-density and multi-layered design provides long lasting pressure reduction that far exceeds any single layer design. And it requires no removal or reconfiguration of parts to deliver optimal results. US Patent 5,398,354. 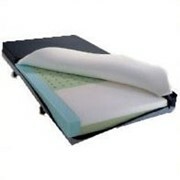 This unique, patented sheet hold-down system keeps flat sheets in place even when patients are repositioned or get out of bed. Allows sheets to remain loose and billowy.US Patent 5,555,578. The exclusive Anti-microbial barrier behind and in front of the zipper thereby prevents the ingress of fluids or other foreign material fluids or other foreign material directly into the mattress interior. The Hypolex Ultra Cover System is the industry’s finest. This unique, coated material is completely waterproof and offers both low friction and low shear protection. It is also anti-microbial and incredibly stain resistant. The Hypolex Ultra Cover System is independently removable and replaceable, and attached with a 360° YKK zipper. 4.45cm thick with a slightly firmer torso area and a super-soft foot/heel area. 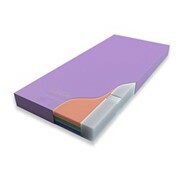 The second co-polymer layer is 5.08cm thick and includes a three zone, anatomically inspired, precision die-cut pattern. 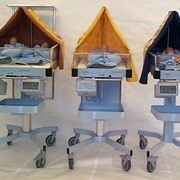 The DXP also includes high density side borders for added patient protection. The DXP also comes equipped with our patented multi-density and multi-layered Heel Pillow™. 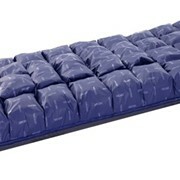 The bottom support layer is 5.72cm of high density polyurethane foam. The bottom cover is a heavy duty, 11 oz. trilaminate vinyl that is waterproof and anti-bacterial. It is also removable and replaceable. It attaches directly to the top cover. Four (4) reinforced turning handles are included.